Touring, motor home and tent pitches are situated in a sheltered touring area next to the sand dunes, providing fully serviced grass pitches with 16 amp electric hook-ups, chemical disposal point and easy access to the recently refurbished Toilet & Shower Block, Launderette and a well stocked shop. The bus stop into Newquay, St. Ives and Hayle is just outside the park. Atlantic Coast Holiday Park caters for both seasonal and overnight business from customers and the park is open from March 1st until January 8th. Free Wi-Fi is now available throughout the park. Caravan and motor home pitches are situated on two areas of the park. One area is adjacent to the childrens play area and is suitable for caravans up to 22ft in length, and is ideal for keeping an eye on your little ones whilst playing. For those with larger caravans, up to 26ft in length, there is newly refurbished quieter area a little way away from the main facilities. All pitches have their own water end 16amp electricity supply. The amenities block has recently been refurbished to a high standard which includes central heating. There are four new family rooms which are fully tiled and include a cubicle shower, toilet and wash basin within the one room. We have an Elsan point, waste water disposal point and pot wash room which is accessible by those with mobility problems. There is also a disabled wet room which allows completely level access and is very spacious. There is a £10 fully refundable deposit for the amenity block key. The caravan park offers 12 hardstanding pitches for touring caravans and motor homes on what is a pleasant and exclusively developed touring area. Facilities include 16 amp electric hook ups, water points, Elsan Point with easy access to a brand new Toilet & Shower Block. The development enjoys privacy from the rest of the park yet has the added advantage of being close to all the park's main facilities, local shops & amenitiesand Pakefield Beach. Whitby Holiday Park is a 4* Holiday Park that offers great Caravan Holidays & facilities for Touring Caravans, Motorhomes & Seasonal Tourers, between Whitby & Robin Hoods Bay in North Yorkshire. The Holiday Park welcomes customers on to its Touring Park. This cliff top area, with its great views of the North Sea & Whitby Abbey, has large grass pitches & 16 amp electric hook ups. The area is served by a recently refurbished Toilet & Shower Block & has access to all the park facilities. 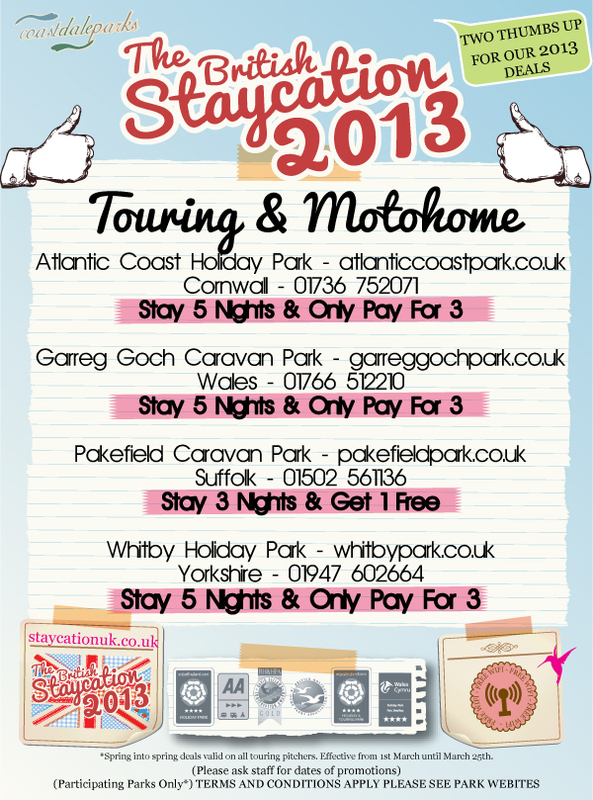 Whitby Holiday Park has Static Caravans for Sale and offers competitively priced site fees, with a 10.5 month season. There is access from the park to the nearby Saltwick Bay beach for families and dog owners. Holidaymakers can enjoy a great Caravan Holiday with us by booking any one of our modern Caravan Holiday Homes. We have Caravans that are suitable for pet owners, those with limited mobility, young families & people looking for Short Breaks & off peak holidays. Please contact us for further details of prices, Special Offers & Discounts. Modern park facilities include a well equipped Laundry, Park Shop (open daily) and a Cafe serving homemade snacks & beverages. A Family Club & Bar is open during the main season offering great evening family entertainment. An Amusement Room is also available.